White kitchens have an everlasting beauty. Even with the changing trends in remodeling designs, a white kitchen will always look trendy. The versatility of the white color blends well with any concept, from a classic and elegant look to a retro or traditional look and even a modern look. White kitchens go well with anything. It is also one of the safest ways to opt for if you want to play with colors and if you are looking for a way to blend them well. Let us look at some countertop ideas for your white cabinets. Choosing a contemporary look for your kitchen is a good way to streamline your space. You can opt for white countertops to blend in with the white cabinets and add a touch of color to the flooring such as black tiles. You also have the option to add a little silver, gold or steel bordering touch for Countertop ideas for kitchen with white cabinets to give it an elegant look. The country look kitchen is a traditional looking kitchen. For the White cabinets and counter top ideas concept, you can have the countertops made in white marble with a backsplash of blue and white tiles. To add the extra special touch, opt for high-rise stools to blend in with a solid white table and you are set. Black and white is a classic combination and when you blend that with hardwood flooring, there is nothing to beat this concept. Countertop ideas for kitchen with white cabinets under this concept would have a completely white base with black marble or granite countertops and black and white tiles in the kitchen. Add that with black stools or high chairs for dining and give it a touch of nice lightning and your kitchen idea is set. Since we are looking at design ideas to go with white cabinets, one of the best things you can do for your kitchen is to blend complementing colors. 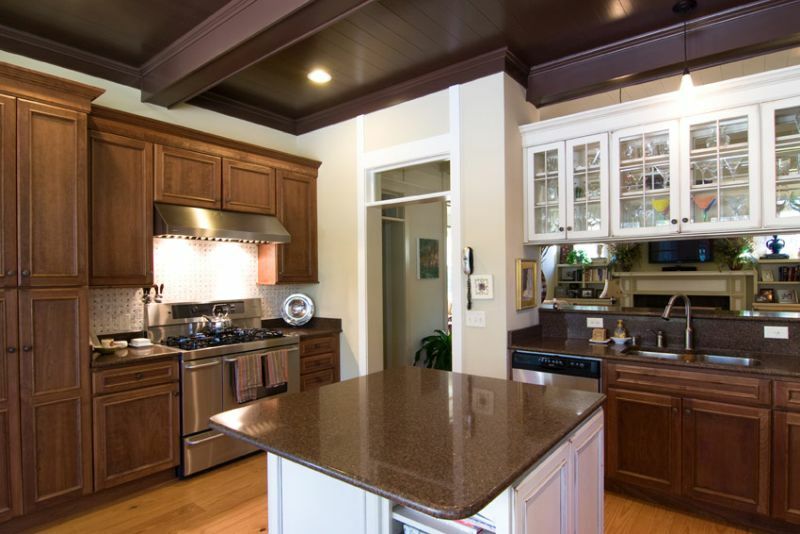 One such concept you can choose for your kitchen includes brown tiles along with white cabinets. For the countertop, you can opt for multi hues of brown marble. You can blend this concept with dark chocolate brown stools if you are making a dining arrangement within the kitchen. Adding color to your kitchen will always uplift the look. One way you can play with White cabinets and counter top ideas is by going all bright. 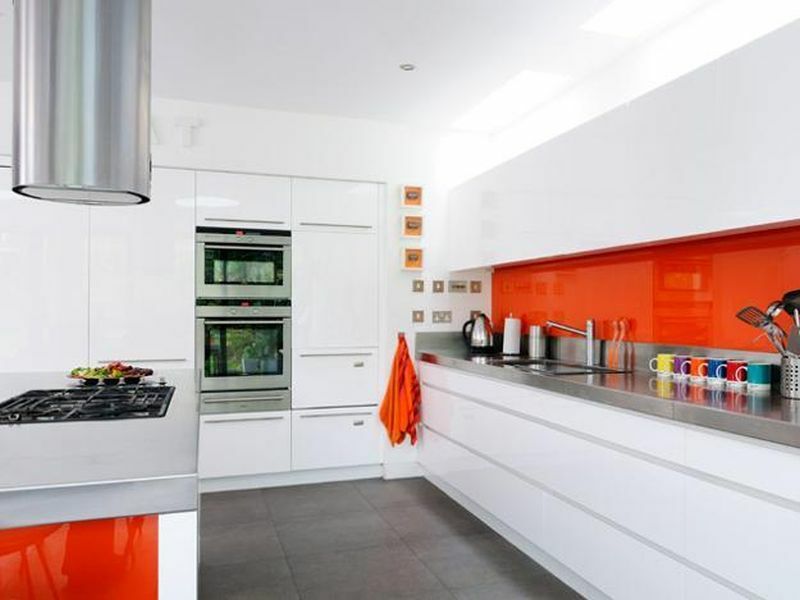 You can think of white cabinets which have a colored border of yellow and orange (thick or thin, it is up to you). For the countertops, you can choose off white or cream and blend it with a backsplash of orange, yellow and white. To match this concept, opt for white marble tiles as the flooring along with yellow and orange colored stools. The beach or waterfront always gives you a calming feeling. Well, now you can get the same feeling in your house. The kitchen design ideas to go with white cabinets with this concept would include beige colored countertops with hardwood flooring. 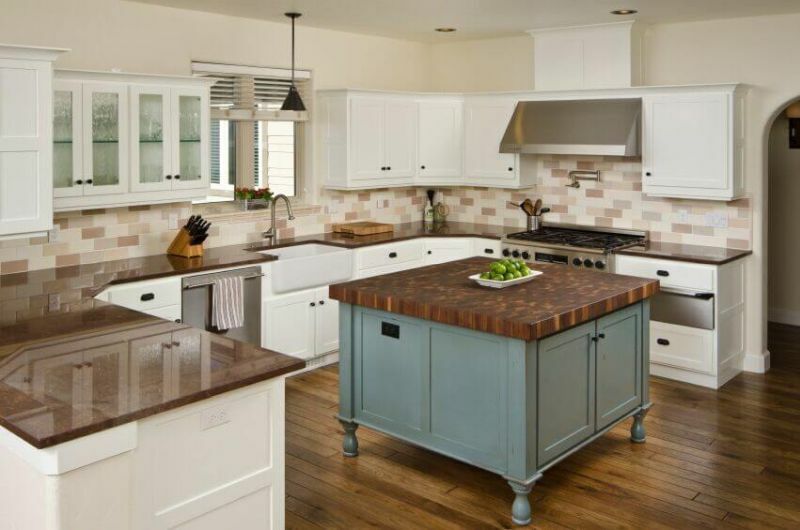 For the island, you can opt for wooden colored base with a beige colored countertop and have white cabinets spread across the kitchen. Do not forget to opt for beach styled or shell pattern tiles as a backsplash and you can blend them with blue colored chairs that have a brown base.